Groupthink is a term developed by social psychologist Irving Janis in 1972 to describe suboptimal decisions made by a group due to group social pressures. It is a phenomenon in which the ways of approaching problems or matters are dealt by the consensusNetworking and Building Relationships (Part 1)This article is part of a series of useful tips to help you find success in networking within your company. Networking plays an important part in our professional lives, starting from our job search, contiuing to joining and working in a company, and finally, advancing our careers. of a group rather than by individuals acting independently. Essentially, groupthink occurs when a group makes faulty or ineffective decisions just for the sake of reaching an agreement. Let us consider an example in a business setting. There are four mutual fund managers – Jeffery, John, Jack, and Jane – who are each in charge of a mutual fundMutual FundsA mutual fund is a pool of money collected from many investors for the purpose of investing in stocks, bonds, or other securities. Mutual funds are owned by a group of investors and managed by professionals. Learn about the various types of fund, how they work, and benefits and tradeoffs of investing in them for Company A. The four fund managers meet bi-weekly to discuss investing strategiesStock Investment StrategiesStock investment strategies pertain to the different types of stock investing. These strategies are namely value, growth and index investing. The strategy an investor chooses is affected by a number of factors, such as the investor’s financial situation, investing goals, and risk tolerance. and their top picksBlue ChipA blue chip is a stock of a well-established corporation with a reputation for reliability, quality, and financial stability. Blue chip stocks are usually the market leaders in their sectors and have a market capitalization running into billions of dollars. of the week. In addition, each of the four individuals trusts each other’s judgment. During one of their bi-weekly meetings, Jeffery announces that he plans to make a large buy of shares of a company, as he thinks the company shows strong fundamentals. The other fund managers, John, Jack, and Jane, decide to go along with the plan and buy shares for their own mutual funds without doing individual research on the company in question. A couple of weeks later, shares of the company drop by 80%. 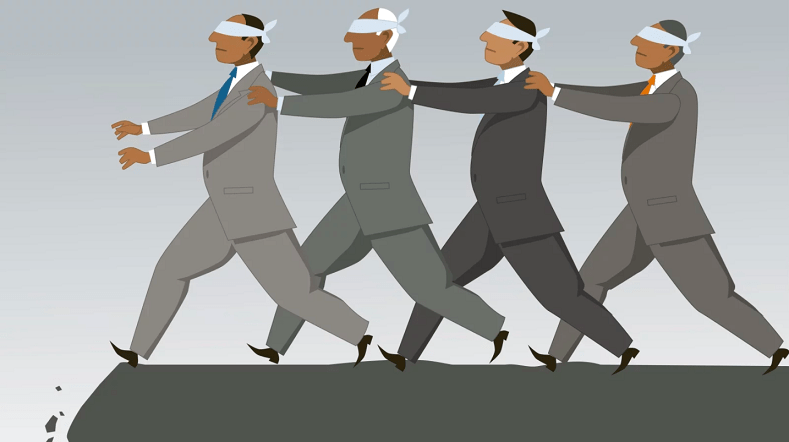 In the example above, the fund managers became victims of groupthink as they followed the consensus of the group rather than independently analyzing the company proposed by Jeffery. Therefore, the fund managers failed to point out or critique the flaws in Jeffrey’s thinking. Members of the group share an illusion of invulnerability that creates excessive optimism and encourages taking abnormal risks. Victims of this behavior ignore and discount warnings and negative feedback that may cause the group to reconsider their previous assumptions. Victims ignore the ethical or moral consequences of their decisions and believe unquestionably in the morality of their in-group. Members of the group possess negative and/or stereotypical views of their “enemies”. Victims apply direct pressure to any individual who momentarily expresses concern or doubt about the group’s shared views. Members are not able to express their own individual arguments against the group. Victims avoid deviating from what the group consensus is and keep quiet. Doubts and concerns about the group are not expressed and victims of groupthink may undermine the importance or validity of their doubts. Victims of groupthink share an illusion of unanimity – that the majority view and judgments of the group are unanimous. Victims of groupthink may appoint themselves to protect the group and the group leader from information that may be problematic or contradictory to the group’s views, decisions, or cohesiveness. Groupthink, in essence, values harmony and coherence over accurate analysis and critical thinking of individual members. It creates a group where individual members of the group are unable to express their own thoughts and concern, and unquestioningly follow the word of the leader. For example, think of a corporate meeting where the members of the board just nod in agreement instead of challenging the ideas proposed. The following example demonstrates how destructive groupthink is by accepting the ideas of a group without critically questioning it. The attack on Pearl Harbor is an excellent example of groupthink. Despite the interception of Japanese messages, US naval officers based in Hawaii did not seriously take warnings from Washington about a potential offensive attack somewhere in the Pacific Ocean. The officers thought that the Japanese would not dare to attack the US. Nobody challenged the idea and instead rationalized why an attack was unlikely to happen.